After a five year wait the EMC finally managed to stage a July meet and those lucky enough to be there enjoyed the finest summer weather for three years. It was hot. In fact, it was so hot and sunny that I climbed in shorts on Saturday and the glare from the rock made sunglasses essential until late afternoon. Dry, warm rock and no crowds. Scotland at its best. On Saturday morning I met up with Fiona M in Glencoe and we headed for the climbs on the East face of Aonach Dubh. Starting at the Weeping Wall, we climbed up through the terraces via Spider Right-Hand, Da Vreemde Stap, and Hesitation before twice descending to climb the classic lines of Archer Ridge and Quiver Rib. Katrina and Sharon had an amazing introduction to Glencoe, completing the Aonach Eagach ridge traverse with Tim under blue skies and then extending the ridge traverse to the Pap of Glencoe. An interesting descent ensued and at one point only Tim’s sunhat was visible above the bracken. There was nothing for it but to climb back up the Pap and find the correct descent. Further west, Margaret and Bethany used the local bus service to help them complete a linear walk over Fraochaidh, while back in Glencoe, Sara and Pete combined the Buachaille Etive More and Buachaille Etive Beag ridges from Glen Etive. New members Pauline and Dave completed the classic Black Mount traverse, walking from Victoria Bridge back to the hut and taking in the summits of Stob a’ Choire Odhar, Stob Ghabhar, Creise and Meall a’ Bhuiridh. Despite my initial worry that the burn next to the hut would be dry after 2 weeks of hot weather, there was still enough to flush the toilet and wash the dishes! No bathing in the burn was necessary, however, with the discovery of hot showers just up the road at the Glencoe Mountain Resort. One more good reason to stay at Blackrock. And with a refreshing breeze to keep the midges at bay as well, it was even possible to sit outside with a beer and watch the setting sun over Glencoe. We were promised another glorious day of sunshine on Sunday but the mist was slow to burn off the summits and it was after midday before many of the bigger peaks cleared. Sara and Pete headed down the road to Bridge of Orchy where Sara continued the endgame of her Munros. Leaving her bike at the foot of Beinn Mhanach, she completed a linear walk over Beinn Mhanach and Beinn Dorain, with Pete walking in on foot to collect her bike. Now that’s service for you! 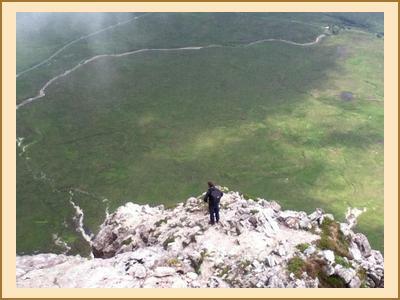 Pauline and Dave walked the Buachaille Etive Beag ridge, over the summits of Stob Dubh and Stob Coire Raineach, while at the end of Glen Etive, Bethany and Margaret climbed the Corbett of Beinn Trilleachan. Tim, Katrina and Sharon continued their tour of classic Glencoe scrambles with an ascent of the Buachaille via North Buttress. At one point Sharon was clinging on, halfway up a chimney and when asking what to do next, Tim replied with ‘whatever works’. This was all that was needed to spur Sharon on to the top. 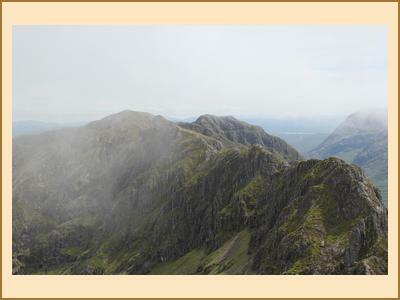 After waiting in vain for the mist to clear from the summit, they then descended Curved Ridge! Also on the Buachaille, Fiona and I headed for Slime Wall, hoping that after weeks of hot weather the wall would not live up to its name. Unfortunately, horders of other climbers had the same idea and so we switched our plans to Raven’s Edge. This climb takes the right edge of Raven’s Gully up the Cuneiform Buttress. Despite some route finding worries at the start of pitch 3, the climb lived up to its reputation and the final pitch on the exposed wall of Raven’s Gully did not disappoint. With the mist off the summit it seemed churlish not to pay our respects and enjoy the fine views over Rannoch Moor. All in all a very enjoyable meet and it made me wonder why the July trip has been so unpopular in previous years. I suspect it was the switch away from camping that made the difference this year. Whatever the reason, I hope the July trip is here to stay.